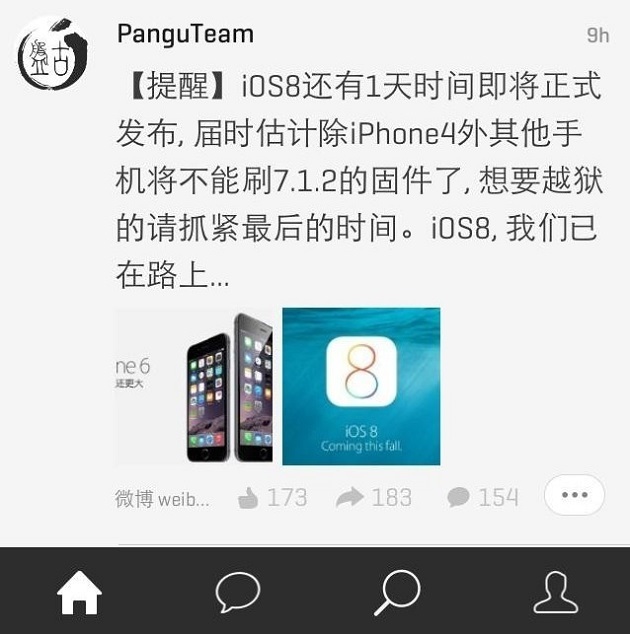 In a revelation that can only be defined as a good news, the team behind the Pangu tool has announced that it is currently working on an iOS 8 jailbreak. This announcement was made by the team on Chinese social networking site Weibo in a message that clearly advised users to upgrade to iOS 7.1.2 before the release of iOS 8. While advising jailbreak users about upgrading to the then latest available version of iOS the team also revealed that they have already started working on the jailbreak for iOS 8 and are “on the way” towards its public release. Of course this does not confirm that the jailbreak will be coming anytime soon, however if their past is any indication then Team Pangu do have a tendency to surprise everyone with their out of the blue releases. The group unexpectedly released iOS 7.1.1 jailbreak a few months ago beating everyone else including team Evad3rs. Team Pangu isn’t the only one working on jailbreaking iOS as we are sure Evad3rs will also try their best to release the tool for public. The jailbreak for iOS 8 is more significant because not only it is a major release but also because two new devices that include iPhone 6 and iPhone 6 Plus will also be jailbreakable once an updated Pangu8 or Evasi0n8 tool for iOS 8 has been released.